The Bangladesh government’s plan to take back 2,000 acres of land out of nearly 2,500 acres from the Korean Export Processing Zone (KEPZ) would jeopardise an investment of $1.2 billion that South Korean companies are planning to pump into the economic zone. Experts said it would send a wrong message to foreign investors who see Bangladesh as an attractive destination for relocating their factories at a time when the government is desperately seeking foreign direct investment to create jobs and boost economic growth. An impasse between Youngone Corporation, the operator of the zone in Anwara in Chittagong, and the government has been going on for a long time over the government’s delay in executing the deed transfer of the land it had allocated to the KEPZ in 1999. However, the government has blamed Youngone for its failure to fully use the industrial land in the KEPZ. In a meeting of the National Committee on Land Use in February this year, the prime minister asked the officials concerned to reclaim all but 500 acres of land as the rest has remained unused. Senior officials of the KEPZ said they knew nothing about the meeting, as no correspondence was made with them about the decision. In 2012, the 17th meeting of the board of governors of the private EPZ cell under the Prime Minister’s Office decided that the deed of transfer for 500 acres of land would be executed initially, and the remaining land would be handed over later, depending on how well those 500 acres were utilised. It prompted the KEPZ to file a writ petition with the High Court in July 2013, challenging the meeting’s decision. The court stayed the execution of the decision and the issue is still pending with the High Court. Later, in May this year, the board of governors decided that the decision would be taken after the disposal of the writ. Under the circumstances, Finance Minister AMA Muhith said in September last year that the government would take back 2,000 acres of land as Youngone had failed to use the allocated land. Youngone was allocated about 2,500 acres of land after the deputy commissioner of Chittagong in 1999 received full payment for the land acquired for the industrial estate. But the deed of transfer was not executed by successive governments although the issue is crucial to bringing investors to the KEPZ, said a senior official of the zone. The Korea-based company even paid 50% more than the price for the KEPZ land, he added. Although the government says that the KEPZ has not been able to utilise more than 500 acres of the allocated land, Youngone has the legal obligations not to use more than 1,200 acres, as it must set aside 52 percent of the land for plantation, open areas and water bodies. It can only use up to 48 percent of the land for factories, utilities, roads, accommodation, hospital, schools and other facilities. The KEPZ has developed 1,165 acres of land so far, building 24 kilometres of roads and constructing 22 factory buildings. The development work of the zone is scheduled to be completed by 2019, according to Jahangir Saadat, president of the KEPZ. Youngone, a South Korean company engaged in the manufacture and distribution of sportswear and shoes, and other Korean companies plan to invest $1.2 billion in the zone by 2020, setting up 150 factories in which 100,000 people could be employed directly. Youngone has so far invested $150 million, developing infrastructures and setting up 22 factories despite non-cooperation from the government. It plans to raise the investment to $250 million by 2016. 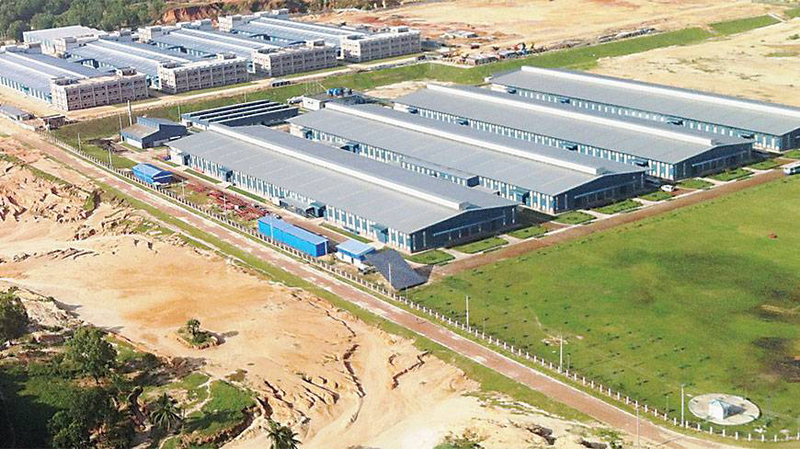 Of the 22 factories, seven are running commercial operations, creating 11,000 jobs for local Bangladeshis. The rest of the factories would be ready by 2016, creating jobs for 43,000 more workers. Zahid Hossain, lead economist of the World Bank in Dhaka, said this would give a wrong signal to foreign investors if the government took this unilateral decision on reclaiming the land. “It will set a bad precedent. The issue should be sorted out through a bilateral discussion,” he said. He also said the government was setting up a number of special economic zones to woo foreign investors. “The foreign investors would seek guarantee that these zones will not be taken back in the future,” Zahid said. Over the years, several foreign investors such as LG and Samsung contacted the KEPZ authorities to get plots, but had to back out for land-related complications. Samsung was interested in setting up its factory at the KEPZ by investing funds to the tune of $5 billion to manufacture mobile handsets, but it could not proceed for these land issues, said Lee Yun-young, South Korean ambassador, in December last year.